The guys from CyanogenMod have again a nice little goodie for you. 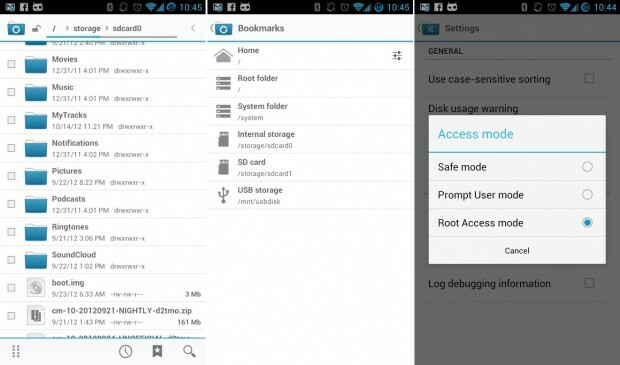 Now available in 10 CyanogenMod nightly builds is a dedicated file manager is used. And this has, not surprisingly, some of the root functions and also, three different access modes. There is no such a file manager, it is not in the pure Android. After the CyanogenMod Enwickler had inegriert short before its own update system in the latest version CM10, now comes the next blow. Now they have built a very good file manager successful in the CyanogenMod 10 Here, the developers probably did not need to catch up to the original firmware. The new file manager comes in chic, but holo-effect coat purist design of Android so. As seen in the screenshot, all the important things a file manager have been integrated. For the guys from CyanogenMod but we should not expect anything else. Maybe Google sees really close and we see in the next version of Android also a file manager? Sort of like a file manager should really come as standard of any operating system. The developers of Android, it may look - until now - not so. However, shows the integration of such into the CyanogenMod 10, that it probably is a great need for such a system-relevant app. So Google, let's go!